Looking for holidays of your dreams? 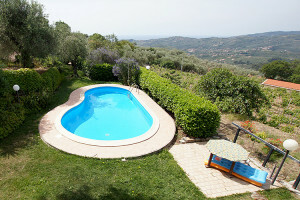 Discover our heavenly holiday homes with pool in open location in Liguria. After arriving at your vacation house, the car is quickly unloaded while the kids are already staging the first water battle in the pool. Generously designed holiday houses beckon one to an all around feeling of wellbeing. Pets on request, garden, Parking lot, balcony, terrace, loggia, BBQ, roof terrace, playground, outdoor furniture, Sat/TV, Washing machine, Dishwasher, 8 bedrooms(s) Idyllic, well furnished villa located on a quiet slope within an olive-grove, 4 bedrooms, 2 bathroom, 2 terrace with seaview, BBQ Playground for children Private parking terrace Garden with barbeque swimming-pool and sunbathing terrace. The numerous bedrooms with double or single beds, beautiful terraces or gardens, parking yards at the house, and cozy sofa corners fulfill all your wishes which you had noted down earlier on your wish-list. It is wonderful if the pool is directly at the house, and if one can devote oneself completely undisturbed to a book while relaxing on the couch under the parasol without the stress and hectic rush of having to pack things for the beach. Wake up, cool down and start the day refreshed! After waking up, you cannot wait one moment for the window shutters to open so that you can feel the sun’s rays on your skin. Cool off quickly in the pool right at the house, pull a few strokes, keep the body fit and healthy and the typical day of vacation in Italy has started. 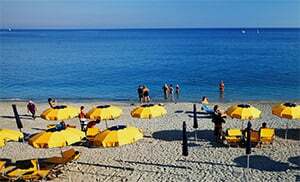 Whether you want to spend the whole day in the pool and to relax quietly in the adjacent garden, or to actively tour the Italian coastline, the sea or the landscape, is all a matter of your choosing. 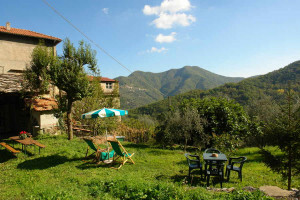 Liguria offers the most diverse excursion possibilities for you and your fellow travelers. There are numerous coastal stretches and lidos, as well as walkways and mountain-bike routes to discover. A day’s excursion to a coastal resort like Imperia, San Remo, Portofino or even to the Formula 1 in Montecarlo, is also a wonderful idea for you and your loved ones. 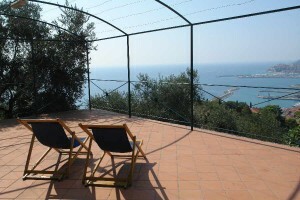 Therefore, use this chance and experience a diversified Italian vacation in the holiday house like never before. 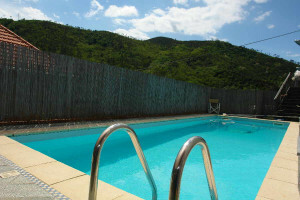 No matter whether it is in the hinterland or directly at the coast, a holiday house with a swimming pool is always the right choice. Plunge into your swimming pool before or after a visit to the beach and at the same time enjoy the view of the sea and the splendid natural environment with friends, family and partners. 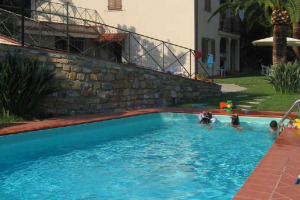 The choice of a communal pool is often the right decision when it comes to children. Children are quick to find friends to play with in the cool waters or in the garden. Many of our holiday apartments are also perfectly suitable for such. Everybody in your entourage will also get their money’s worth in as far as the culinary side of things is concerned. The local restaurants, Italian Pizzerias, bars and ice-cream parlours with healthy and rich Ligurian specialties. There is nothing more beautiful than to lie on the sun terrace of your own holiday domicile, to refresh your legs in the pool and in the process to enjoy the tranquility. As an accompaniment, a bowl filled with fresh Italian fruits, and one will feel perfectly well. To secure such moments for yourself, you should together with the BlumenRiviera team decide on a holiday house with a pool in northern Italy, and rent a suitable holiday house from our holiday properties catalogue for Liguria. 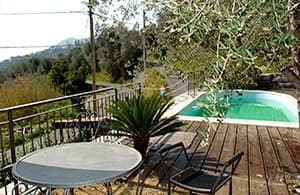 We shall gladly help you to fulfill all the points on your wish-list, so that your vacation in the holiday house or in our holiday apartment on the Ligurian coast will turn out to be the most beautiful you have ever experienced.